Proclad has appointed Alessandro Rottach as Managing Director for its UK and European operations, as it looks to strengthen its position in the market and embark upon a new strategic growth plan. 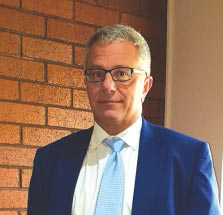 Alessandro brings extensive experience in the global engineering sector having been Managing Director of United Cast Bar Group, Europe’s leading foundries and suppliers of cast iron bars with eight owned distribution warehouses from Spain to Sweden and also part of Proclad Group. The appointment underlines Proclad’s commitment to investing in its UK operations, which incorporates a number of Fife-based companies including FTV Proclad International, Proclad Induction Bending, Proclad International Forging, Proclad Heat Treatment, Dawson Downie Lamont and Innovative Tooling Solutions.